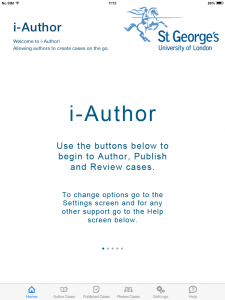 The i-Author app, is an interactive application based on a virtual patient concept. The app enables users to create their own cases offline and ‘on the go’ using their tablet instead of a desktop computer. As authors of cases, the users are able to create cases containing personalised text accompanied with media such as videos, audio and images and also adding questions and scoring within the cases. Authored cases can easily be published to peers to collaborate on authoring the cases or published to viewers such as students employees or the wider community. The app has been co-developed by the Intelligent Business Optimisation System Solutions (iBOS Solutions) and the e-learning Unit at St George’s, University of London (SGUL). 1 Pings/Trackbacks for "i-Author (The virtual case authoring app)"